Degree Audit compares a student's academic progress with your school's degree requirements. In addition to showing how the student is faring towards his current degree, it also lets you see how his progress stacks up against your other degrees. The degree audit is a tool that helps you make a decision. A student might review it and decide to switch degrees. An advisor might decide to recommend one class over another for a student. A registrar might decide to grant a degree to a student. You get the idea. The degree audit starts by showing the most advanced degree (and specialization, if any) the student is currently pursuing (including the catalog year, which corresponds to the degree's requirement year). To see other degrees and options, select from the drop-downs. You can change degrees, catalog years, and specializations. When you make a selection, the audit automatically updates. General degree requirements are the minimum GPA and overall/resident credits or hours the student needs in order to earn the degree. Green items with a big green check indicate that the student has met the requirement. Grey or black items indicate that the student has not met the requirement. If you're using Populi to track clinical hours, this tutorial explains how they appear on the degree audit. 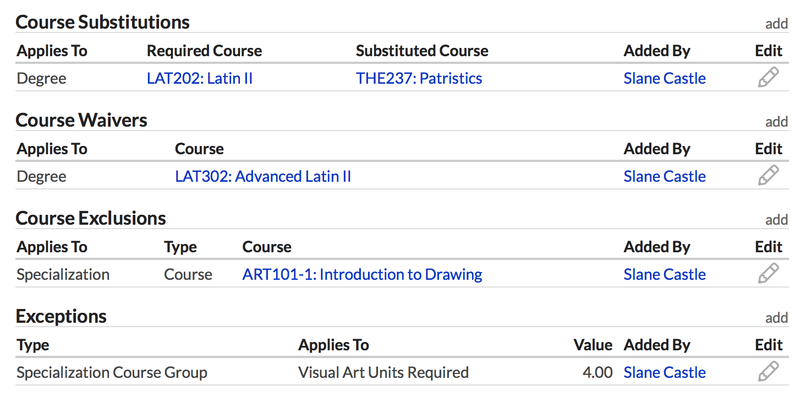 Course requirements are organized by course groups and show whether courses have been completed—that is, the student's finalized course grade met the minimum grading requirements for the course group. Each course group leads with a summary of the requirements and whether the student has met them. As is customary, green indicates that the requirement has been met! If a substition, waiver, or exception has been applied that affects this course group, you'll see a red notice to that effect. X credits/hours/courses completed: The student met the minimum grade requirement for this course and earned X number of credits/hours that have been applied to this course group. Courses are also considered completed if the student has completed an equivalent or if another course has been substituted for this one. Applied to X: The student met the minimum grade requirement for this course and it is being used in X course group. X credits in progress: The student has not yet been finalized in this course; when he is, the course will be applied to this course group. X credits waived: A waiver has been entered on this student's degree audit; he is not required to complete the course. If a course only appears in one course group, it will simply apply to that group once the student completes it. If a course appears in multiple course groups, you can choose the group to which it will apply. A solid check means that the course is applied to this course group and can't be applied elsewhere. A check in a box means that the course is applied to this course group but can also be applied elsewhere. An empty checkbox means that the course could be applied to this group, but is applied elsewhere—check the Status column to see where. Unused courses (including resident and transfer courses) are completed courses that are not included in any of the degree's course groups. They count towards the degree's general requirements but do not count in degree course requirements. Consult this list when adding exceptions or substitutions (see below). The degree audit lets you substitute or waive course requirements for the student, or modify the degree requirements by adding an exception. You can also do any of the following for a specialization. After adding any of the following, you can modify the item by clicking . 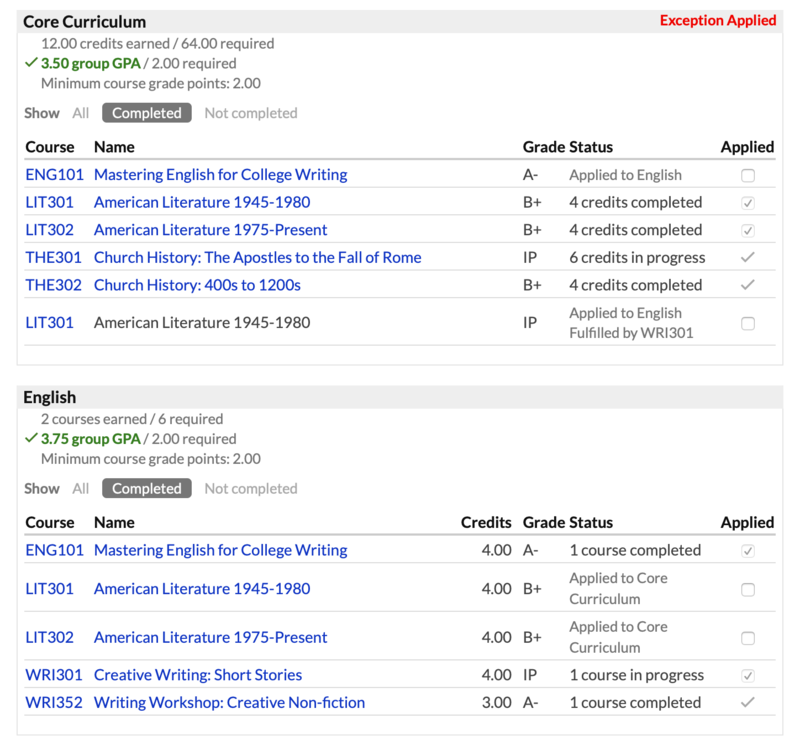 You can set up a substitution for any course by any other course, whether or not the student has taken either one. Click add next to Course Substitutions. Select whether this substitution will apply to the degree courses or those for a specialization. Search for and select the required course. Search for and select the substitute course. After adding the course substitution, it will list in this section. As soon as the subsitition affects one of the course requirements, you'll see a note in the course group and in the course's status. You can waive any individual course requirement. Click add next to Course Waivers. Select whether this waiver will apply to the degree courses or those for a specialization. Search for and select the course you wish to waive. After waiving the course, it will list in this section and under any affected course group(s). You can use an exclusion to force a given course "out" of applying to a degree or specialization and into applying to the course requirements for the other. For example, you could exclude ENG101 from the student's English major so that it applies to his Bachelor of Arts degree. Click add next to Exclusions. Select whether to exclude the course from the degree or specialization. Select the course you wish to exclude. 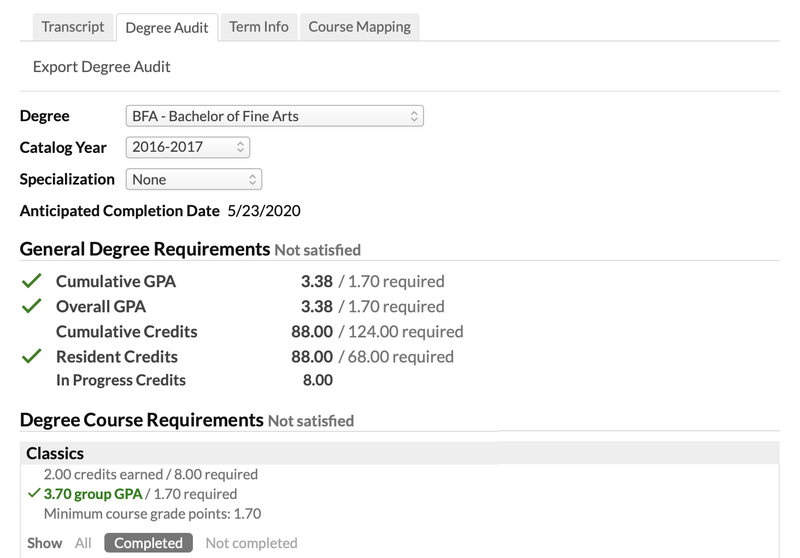 A degree audit exception lets you modify any of the degree's requirements—whether general reqs or those pertaining to a course group. Click add next to Exceptions. Select whether this exception will apply to the degree, specialization, or a course group. Select which requirement you wish to adjust by entering a value. Check the notice next to the field to see how this exception will change the requirements for the student. Enter a note explaining the exception (optional). After adding the exception, it will list in this section; it will also be indicated in any part of the degree audit affected by the exception.